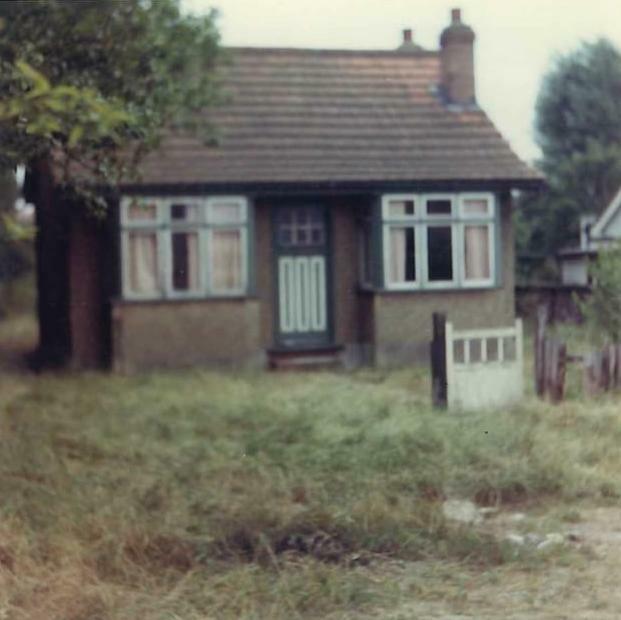 Our bungalow in 1964. Photo: © Jacqueline Douglas. We lived in a 1930s bungalow with a 100' garden at 9 Page Road, the end of a cul-de-sac in Bowers Gifford. 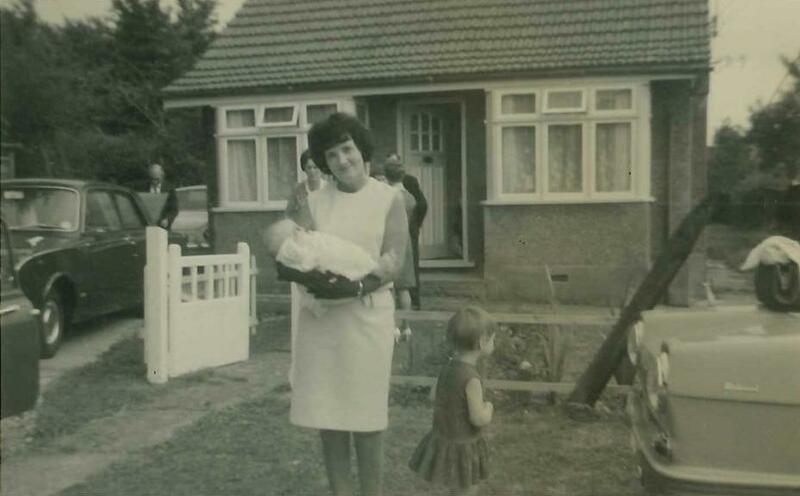 Our parents bought the property for £2000 just before I was born in 1964 and in many ways it was a good place to grow up. We were allowed to ‘play out’ with our neighbours almost whenever we asked, it seemed. We had next to us what we called ‘the woods’, a few acres of undeveloped land that in the summer we sometimes used to get ‘lost’ in all day. Dad and our neighbours had in there a red e-type Jag, which I suppose they wanted to do up one day. Further in, there were WW2 bomb craters known to us just as them ‘bomb holes’ which we used to whizz into on our bikes. Sometimes, we'd walk right through the woods and out into the open beyond the trees, to the corn field which was part of Sadlers Farm. At the far edge of the field, near the London Road, was what we wrongly called an ‘air raid shelter’, a look-out pill box from WW2. Sometimes in the summer, we couldn't go across the field because of the stubble burning. When we weren't in the woods, we were playing ‘Top Trumps’, ‘123 block home’ or riding up and down the road. I must have been about five when one day we had to be careful where we walked as we left home because they were surfacing the unmade road with concrete. I was scared of the rag and bone man, he had the strangest way of saying ‘any old iron?’ When we were older, the boys had Raleigh Chopper's and in the winter wore Parkas. In the summer, when the Unigate milkman came, Shaun would ask him for a lemonade, seemingly ‘free’ but I think I realised it would be added to his Mum's bill, which I knew we wouldn't be allowed to do. We had silver top milk delivered, but we never called it that, only needing to distinguish ‘gold top’ with full cream, bought occasionally because it was good for us, and ‘red top’ which Pat and Terry Woods next door had - I think now we'd call it semi-skimmed. In our kitchen, there was a gas cooker with eye-level grill, an enamel sink, a small formica table with flaps, a fridge and a tall pale blue and white cupboard with a pair of square cupboards at top and bottom, the top ones having glass doors, and a fold out flap in between for making pastry. 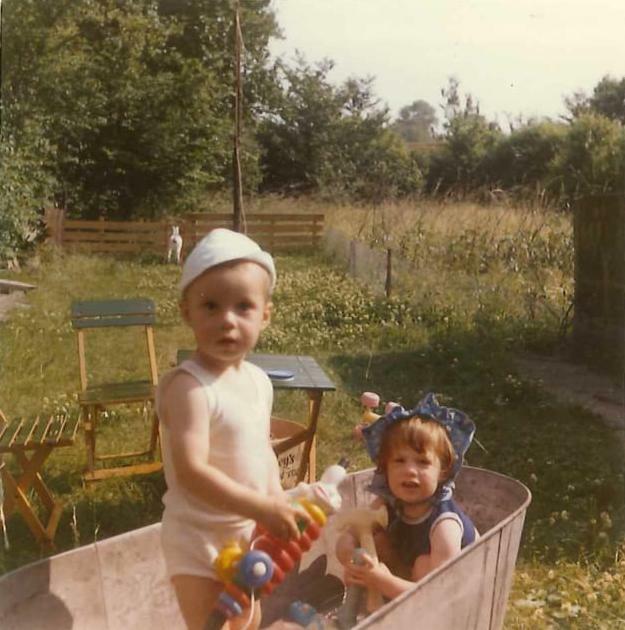 Until I was 11, there was no bathroom and the four of us had our weekly bath in different ways: Mum bathed me and Barry separately in the kitchen sink, she pulled a plastic tub, what I now realise was a baby's bath, into the living room and made the best of that, and Dad did the same with an old tin bath, which you can see me playing in here with the boy next door. Playing in the tin bath with the boy next door. When I was 11, Dad built a bathroom with an electric heater in a lean-to extension at the back, and I had my first shower. When we got a phone, we were ‘North Benfleet 622’. Mum shopped at The Dairy opposite the Post Office on Pound Lane and next door at the Wavy Line, or at International on Pitsea Broadway. We had meat delivered wrapped in paper by the boy from Wadsworths butcher at the top of Pound Lane. On Saturday nights, there might be a ‘fry up’, with our neighbours, nicknamed ‘Tooey’ and ‘Boosey’, round. When I was 8, I was crowned Bowers Gifford and North Benfleet May Princess. I wore a blue and silver nylon dress and had a ‘hairdo’ with rollers. When I was three, I went to the Community Hall on Pound Lane in the mornings. Activities were set up around the hall and we could choose what we wanted. I made ‘Dougal’ from the Magic Roundabout from a Fairy Liquid bottle and the right colour gold wool. After break time, when we had the cold drinks our mums had sent us with, we had a story. When I was about to go to ‘big school’, I was taught to write my name. The new school year seemed to be about new shoes and crisp mornings. We got ‘the Lane bus’ to school in Pitsea, so we didn't have to walk up to the London Road to get one. Anyone waiting at the stop would tell newcomers whether or not it had already ‘gone down’ i.e. to the end of its route at the end of Pound Lane so we'd know how long we were likely to wait. Sometimes we saw cows walking up Homestead Road opposite the bus stop to the farm with the same name. We walked one stop further if we wanted to go to the Post Office - we spent our pocket money on Spangles, Curly Wurly, Marathon, Chewits, Jamboree Bags and later, playing the new Space Invader machine. The bus passed the nearer St. Margaret's (St Maggots) and carried on down Gun Hill into Pitsea. There was a stop opposite Pitsea Infant and Junior schools, but we got off a stop early to spend our ‘tuck’ money in Gowers, 5p between me and Barry, which bought us a bag of crisps each. On Wednesdays, we used to go into Pitsea Market, which was on the northern side of the London Road then, and was a mix of indoor and outdoor, the indoor stalls being in 4 large domes that looked like giant igloos. Moving up to the juniors, we started using Cuisenaire rods for counting and they made a lot of sense to me. In the afternoon, there was time when the teacher told us to put our head on the desk and I suppose this was a kind of ‘nap time’. There was a high-ceilinged hall where we had assembly and, with the Lord's Prayer and a hymn. We read the words of the hymns from wads of 3’ high sheets hung at three points from front to back of the hall. These had been written in calligraphy by Mr King. The sheet would be changed for that day's hymn by working a kind of pulley and carefully lifting the weighty pile of papers. If someone was sick in assembly, the caretaker came with a broom and something like ash, and it somehow magically went away. In my first year, we were sent home with a note asking permission to do a project on reproduction. The alternative was to be in a separate class studying ‘the eye’. I was delighted when mum and dad signed the sheet. We were 7 years old and learnt everything with no giggling. It was only until the first year that I remember suffering my only real ordeal of primary school: school milk. Crates of it were delivered each morning, in 1/3 pint bottles. One crate was put in the corner of each classroom and sat there, with the heating on until mid morning. By then it was almost warm, and for me disgusting. I can't drink a glass of milk even now, and sure it's because of this. ‘Thatcher, Thatcher, milk snatcher!’ - the one good thing she ever did? Of course, school dinners weren't brilliant either, but there was usually something you could eat. I avoided pease pudding, pink custard, which I begged the dinner ladies not to pour over my chocolate pudding, and what I now think must have been coleslaw but which we didn't have at home and to me was like nothing I'd ever smelt. After lunch, there was time in the tarmac playground and we swapped beads, and talked about what we'd seen on telly the night before, ‘cos we all invariably watched the same things: ‘what about the bit when…’ We played ‘cat's cradle’ and ‘two balls’, juggling tennis balls against the red brick, waiting until a bit of wall between windows was available, and chanting songs my mum said she knew, too. There was usually a long skipping rope being turned by one person each end. We played ‘it’ and ‘peep behind the curtain’ and if you wanted time out because you had a stitch or something, you crossed your fingers and said ‘fainites’. In summer playtime was on the field. We did handstands and cartwheels, or made daisy chains. Most of my junior school classes were in ‘demountables’. Mr Williams was my 2nd and 3rd year teacher and he was ‘old school’. He taught us times tables by banging a rhythm out with a wooden ruler on his desk – it worked! We were taught scrolly handwriting, dipping our nibs into greeny-black ink that had been made up from powder and water. This was in ceramic ink wells in a specially made hole in our wooden desks. In our history lessons, we used tracing paper to copy pictures from our books into exercise books. There was a school uniform of grey and bottle green, with yellow stripes on the tie. I don't remember anyone wearing it, though, except Mandy Scales who came to school with her hair scraped back into a yellow ribbon, and lacquered so not a single strand moved all day. Until the day the ‘nit lady’ came, that is, and we all thought it hilarious that perfect Mandy Scales ended up with a birds nest on her head. Not having to wear the uniform gave us freedom to wear hotpants (some girls did) and to wear tartan when ‘Rollermania’ was at its height. From time to time, there'd be something for the parents to get involved in, a sale of work, a ‘social’, or just to come and watch our country dancing or sports day with the sack race, the egg and spoon race, three-legged race etc. Every now and again, there was a ‘Dance’ at the Community Hall in Pound Lane and anyone could buy a ticket. Little Pete, a neighbour from Una Road would be DJ and half way through the evening, someone would go to South Benfleet for takeaway fish and chips. We bopped to stuff like Mud's Tiger Feet, Carl Douglas’ "Kung Fu Fighting" and Paper Lace's "Billy Don't be a Hero". I suppose a little later, when I was about 13, one of our older neighbours asked me if I was ‘courting’ and it seemed that that was something old fashioned that people didn't do any more. Once a year, there was a summer Barn Dance up at Hall Farm in North Benfleet, where Dad also used to go fishing, at Jacksons Pond. It was in a huge barn, with straw bales to sit on and, if you went out to cool off between dances, you'd be surrounded by cows. On the unmade roads off Pound Lane at the North Benfleet end were ‘the plots’. Each had a bungalow on, some extended and some still the original little square 1930s homes. Between the road and the bungalows was a wide ditch, with a concrete walkway to the garden gate. Dad worked at MTEs on Progress Road, Eastwood, and there was a Christmas party for the employees’ children. I got a plastic washing machine that took water. Mum didn't work until my brother went to school and then she went to Halwins at Tarpots part time, as a seamstress. Mum took us to Sunday school at Pound Lane Mission in North Benfleet and I liked some of the singing. We were divided into different age groups for a lesson after the service, which was usually a bible story. After that there was nothing to do, no shops were open and it seemed like cricket was on TV all day long. The annual Sunday School ‘outing’ was something to really look forward to and we went to Maldon, Clacton or Walton-on-the-Naze on a coach, singing ‘She'll be coming round the mountains’ and eating our sandwiches too early. The girl next to me said I should send my crusts to the starving children in Ethiopia. Apart from that, the highlight of the long six weeks summer was a day at Chalkwell Beach. We got the green double decker 2 or 151 from the top of Pound Lane along the London Road. Mum asked the conductor for ‘one and two halves’, the metal ticket machine rasped as he turned the handle three times, and we got beige tickets with lilac printing, red ads on the back. We waited in Chalkwell Avenue for the open top bus that ran in the season. The cream double decker seemed something from another world, of style and luxury. We nearly burst as we waited for it, and burst waiting for the moment when the slope of the avenue gave us a view of the blue sea from the top deck, shimmering above the pure white pavilion. In my memory, it's always sunny, but this is my memory of it. My great aunt holding my brother on his Christening day. I'm standing to her right. Our cars can be seen in the background including a Ford Corsair, Ford Cortina Mk1, and in the foreground a Reliant Regal. We're a Ford family and Dad had an Anglia that I just remember, my carrycot used to rest on the back seat, apparently. Then Cortinas, a Corsair and a turquoise Zephyr, one of them with a column-change gear stick below the steering wheel. Title: My 60s-70s Childhood in Bowers Gifford by Jacqueline Douglas. Copyright: © Jacqueline Douglas, March 2013. Comments: This account was supplied by Jacqueline Douglas for use on the Basildon History website.